The Sha’ab Abu Nuhas large coral reef lies in the Gubal straight. This reef is just as well known (although feared) among sailors as it is among divers. There are seven ship wrecks lying on the bottom of the sea, one of them the Ghiannis D. She hit the reef in April of 1983 and over the course of two weeks slowly split in two and sank. She is undoubtedly one of the best wreck dives in the Red Sea. To find the Ghiannis D, leave the lagoon via the channel to the West. Proceed slowly along the Nothern reef at a distance of about 50 metres. It can be seen from the surface after about 200 metres. This is the most accessible of the other wrecks in rough seas. It takes extremely foul weather to make it out of bounds to divers equipped with a zodiac. Current is minimal. The best part of the wreck is the stern section. It lies on the seabed at 28 metres, upright but slightly skewed to one side. She is an ideal wreck for penetration with a number of entry and exit points. Because she is skewed, the interior has impossible angles and perspectives. You find yourself swimming up a stairwell which your mind tells you is heading down. The effect is very disorientating and the conflict between balance and vision can even lead to sea sickness. The engine room is at the centre of this zone. It is large and spacious but dark. Take a torch. There is a large air pocket in the engine room. This should be avoided unless you want to be covered in the layer of oil that floats on the water’s surface. Outside the stern section the masts, railings, wires and cables are festooned with soft corals. Some dramatic photographs can be taken of the superstructure silhouetted against the light. The bow section is also picturesque but it is a long swim away. Your time and air might be better used exploring the shallow mast and rigging of the stern, where you can also do your safety stops. Large potato cod often hang out to the North. Free swimming morays, snapperfish, eagle rays, mackerels, groupers and sharks can also be seen. The Sha’ab Abu Nuhas large coral reef lies in the Gubal straight. This reef is just as well known (although feared) among sailors as it is among scuba divers. There are seven ship wrecks lying on the bottom of the sea, one of them the Ghiannis D. She hit the reef in April of 1983 and over the course of two weeks slowly split in two and sank. 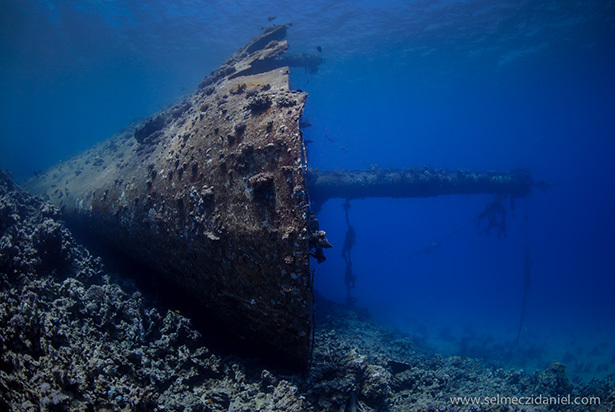 She is undoubtedly one of the best wreck dives in the Red Sea. The best part of the wreck is the stern section. It lies on the seabed at 28 metres, upright but slightly skewed to one side. She is an ideal wreck for penetration with a number of entry and exit points. Because she is skewed, the interior has impossible angles and perspectives. You find yourself swimming up a stairwell which your mind tells you is heading down. The effect is very disorientating and the conflict between balance and vision can even lead to sea sickness. The engine room is at the centre of this zone. It is large and spacious but dark. Take a torch. There is a large air pocket in the engine room. This should be avoided unless you want to be covered in the layer of oil that floats on the water’s surface. Large potato cod often hang out to the North. Free swimming morays, snapperfish, eagle rays, mackerels, groupers and sharks can also be seen during scuba diving.